Creative sparks come from many sources. When I’m trying to stir up some inspiration for my work, I always turn to my favorite activities. Here are the top five things that boost my creativity. 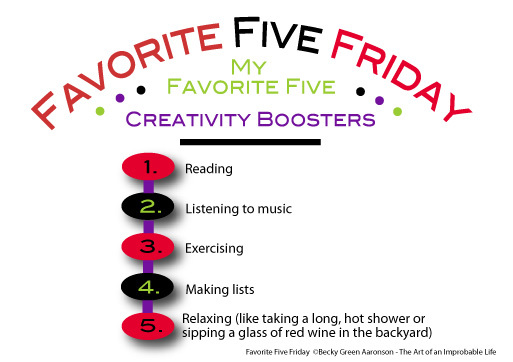 What are your favorite five ways of boosting your creativity? Take five minutes or less and drop your Favorite Five in the comment box. Happy Friday everyone! This entry was posted in Creativity, Favorite Five Friday, Writing and tagged Becky Green Aaronson, creative process, creativity, creativity boosters, Favorite Five, favorite five friday by Becky Green Aaronson. Bookmark the permalink. Music is big for me and walking, lots of walking. I assume between the two my mind takes in and makes mental notes for inspiration. It’s interesting how many people are inspired creatively by music and being in motion. The combination of the two–listening to music as I’m running–is one of my greatest creativity boosters. Thanks for sharing your Favorite Five! These are great. Thanks for stopping by to share your Favorite Five. Looking at other photographer’s work is indeed inspiring! Running provides powerful creative time for me too. I don’t what it is, but it usually provides the magic I need, when I need it most. Needless to say, I’m happy to be healthy and running again after a year of injuries. There’s nothing like traveling and immersing yourself in another culture to spark your imagination. Your senses can’t help but be awakened along the way. Thanks for sharing your Favorite Five! I like these, Arindam! Walking on the street and interacting with strangers is bound to bring interesting/inspiring encounters for your writing and photography. Thanks for sharing your Favorite Five! Have a great weekend. 4.Looking at trees, mountains, lakes, etc. These are great–especially people watching! Airports are especially rich. I never cease to be amazed and inspired by the diversity of humanity. Thanks for swinging by my blog today to share your Favorite Five! Happy Friday to you. Walking has always been my best source of inspiration. I just came back from walking the Camino in Spain, and as I struggle to put the experience in words (I’ve only written a couple of posts about it) I’m beginning to understand how much wisdom I’ve gained from walking down those ancient tree-lined paths. Being in nature and exercising outdoors is one of my great inspirations too. Your experience walking the Camino in Spain sounds fabulous. As a writer, I know I shouldn’t say this, but sometimes the best things in life can’t be put into words. Thanks for sharing your Favorite Five! Aahh, yes, daydreaming…the ultimate creativity booster. Where would we be without it? Facebook is both a curse and a blessing for me. I’m often inspired by what others share, drinking up the creative buzz, but I’m also woefully distracted by it, which pulls me away from the center of my creativity. I’m still working on that balance thing! And yes, art/photography will always be an inspiration for me. Isn’t it interesting how organizing/cleaning makes you feel more creative? Getting rid of the clutter makes room for all the good stuff. Thanks, Britton! You may have just inspired me to tackle my office today! Or…maybe I’ll just head to my “office” in the backyard instead. Happy Friday! I can easily see how gardening and cooking would stir your creative soul. And Legos…there are infinite possibilities there! Thanks for sharing your Favorite Five! I love that you are inspired by talking to your kids! That is a great one. Kids are filled with a wealth of “freewheelin’ ideas.” Making art with kids is also quite inspiring. 5. Travel to Tuscany, Big Sur, Greece, etc. Rodger, these are great! Espresso should definitely be on my list too. Your creativity is clearly stirred from all your travels. Love your photographs! Tina, I can see how meditation is playing such an important role in your life. That’s wonderful. “Long conversations with my husband” should be on my list too. We are constantly firing ideas back and forth to each another.